In spite of rise in price, farmers were short of veggies to sell. Farmers in the province’s veggies basket in Tinh Long Commune were run off their feet to water various legume since price of agriculture produce has risen two or three times compared to normal days. Farmer Huynh Thi Tinh who grows basella alba, Centella and some other vegetables in 500 square meter farm said that this year, Centella has quadrupled at VND30,000 a kilogram while small spring onion has fetched VND15,000 per kilogram and basella alba has been priced at VND10,000- VND15,000 a kilogram, French bean has been sold at VND 40,000 per kilogram and cucumber at VND20,000-VND25,000 a kilogram. 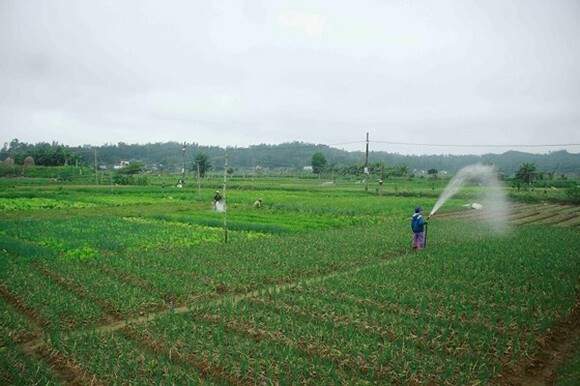 However, though the veggie price has risen, farmers are short of herbs to sell because most farmers left the land abandoned in rainy season, said farmer Truong Thi Kenh in TInh Long commune who has grown basella alba on 500 meter square farm. Similarly, small spring onion has turned yellow due to fog. Presently, farmers are taking care of their farm to sell vegetables in lunar February and March. Farmer Pham Minh said that with present price, he could earn VND10 million for a 500 square meter farm adding that he is growing small spring onion and Water morning glory to meet the demand.